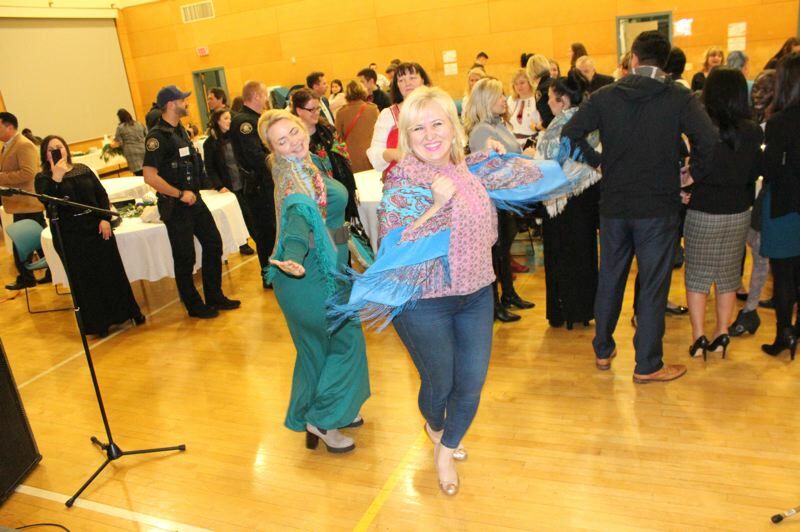 Russian is the third-most spoken language in Oregon, after English and Spanish. There are around 50,000 Slavic immigrants in the Portland area. Most come from the former Soviet Union and speak Russian. Ukrainians are the biggest group. 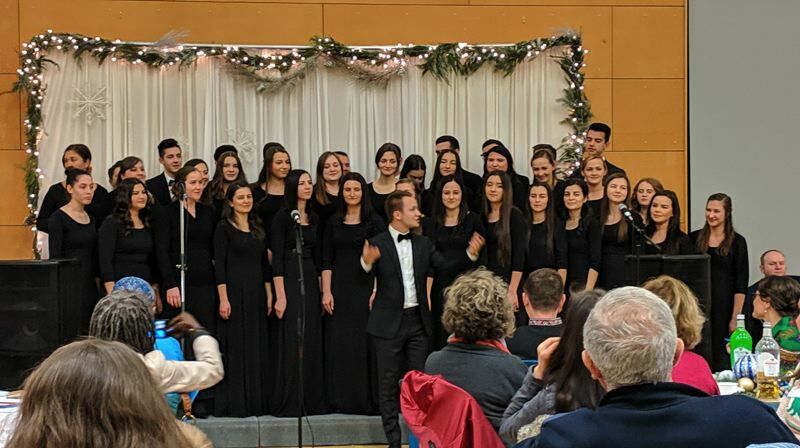 Under bright lights, families listened to accordion music and hymns from the Portland Christian United choir, made up of dark-haired teens in tuxes and black dresses, with just the occasional Apple watch disrupting the uniformity. 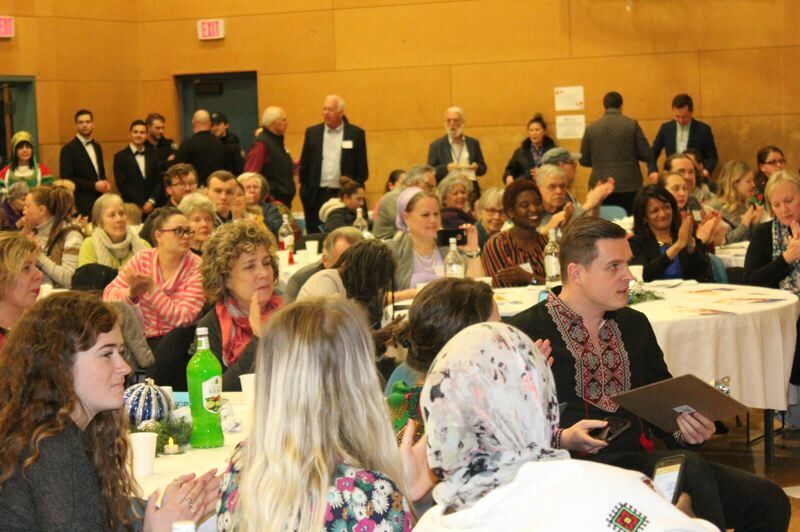 They heard speeches from Slavic Center advisory board member Andrey Georgiev, and from electeds such as Jo Ann Hardesty and Susheela Jayapal. Parking on side streets was tight as mini vans and SUVs crowded the area for blocks. There was no alcohol, so hundreds of people drank apple juice and dined on dumplings and rice and posed for photos with decorative breads. Immigrants may land in Portland with little English and no contacts, but they have to work. 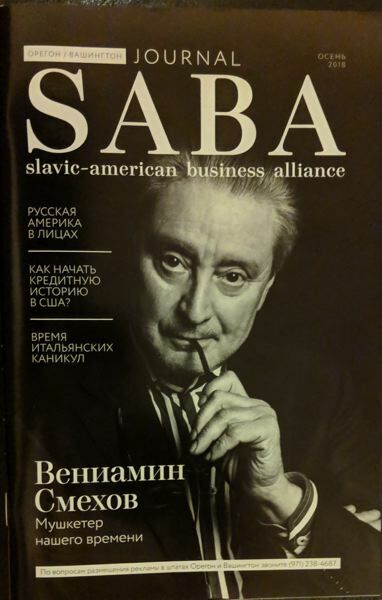 While Russian speakers are known for working their way up from the bottom in blue collar industries like trucking and construction, they are less visible culturally. However, they are starting to build their own social capital at events like the IRCO bash. Some of that party food was prepared just two blocks away at Russian Elegant Food, and donated by the owner, Elena Vykhovanets. Of Bulgarian heritage but born in Kazakhstan, she and her husband, who runs a hardwood floor firm, bought the business in November 2015 on a whim (hers). "I used to be a hairdresser, one day I don't know why, I wanted to work in a kitchen and cook. So, I said to my husband 'Let's buy this place.' He said 'No, I just paid for your hairdressing license.' I talked him into it. We came checked it out. I like this main store, I used to come here. I like that it's small, not too big." 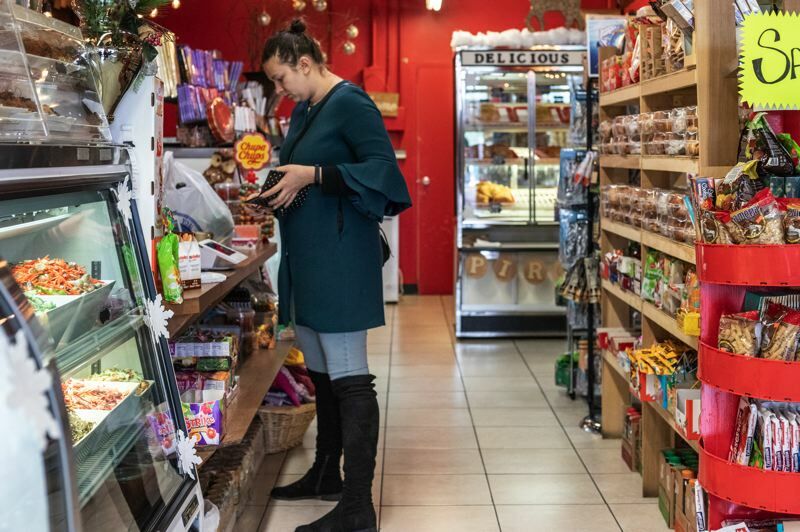 The store is one of around a dozen Slavic and east European food shops in the metro area. Many are in the Foster Powell area, where Russian speakers settled in the 1980s and 1990s. They were protestant Christians, refugees from the Soviet Union, and have since moved on to bigger homes in Gresham and Clark County. Vykhovanets says Russian Elegant Food has the advantage of being the first store over the river from Vancouver. "This location is really good, I get a lot of taxi drivers, it's near 205. Some of them already know what they want — they just put the money (down) and leave. We get a lot of Arabics and Somalians." 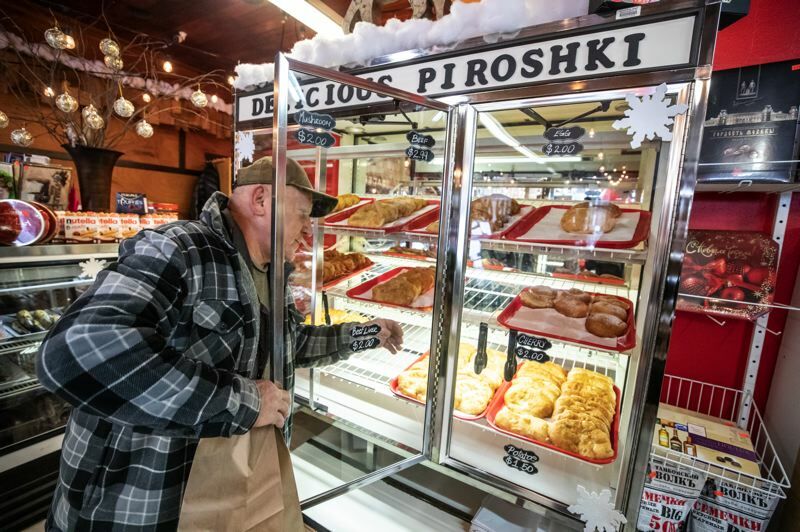 They make their own pirozhkis, a popular handful of deep-fried dough with a filling that ranges from cherries to chicken. The store specializes in pastries, such as meringue-lined cookies shaped like roses, many black and rye breads. The doing business as name is House of Bread, because they sell more than Russian food, but the brand is strong. "Pirozhkis sell out fast. Our clients are American, African, Russians, lots of Hispanic people, even homeless people. They love it that they're so cheap and so filling." 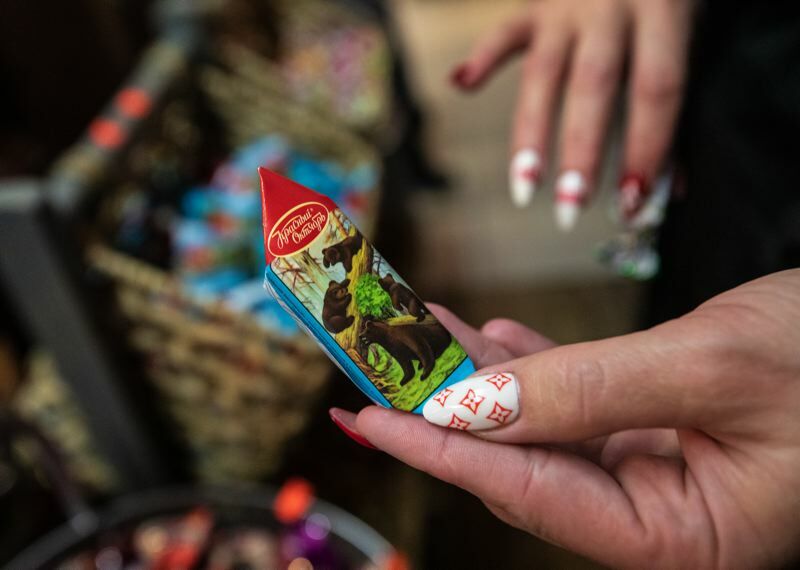 There's a wall of Russian candies such as cosolapa mishka (little bear with crooked feet) and aromashka (daisies). 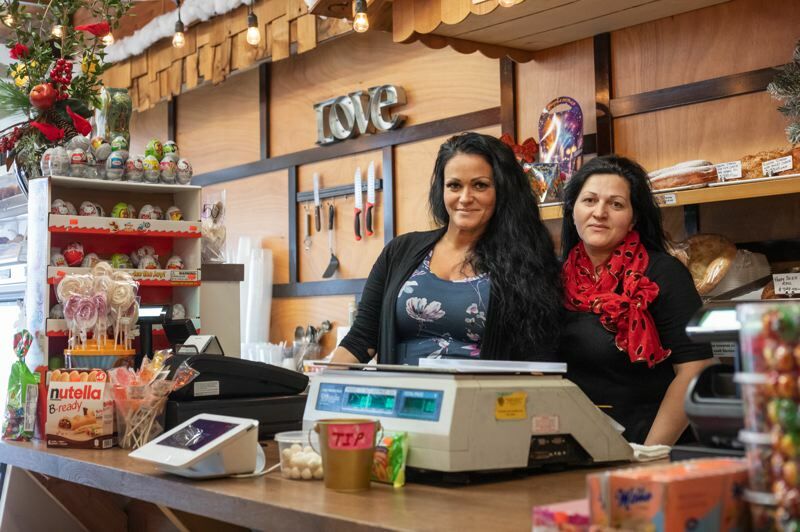 She gets much of her stock from wholesalers, whom she deals with online, such as Global (near the airport) and Bandi for ice cream, pierogis, dairy and fish. She tries to keep prices competitive with the local Russian stores. "Everything I buy, I times it by 1.5, and whatever comes out that's how I sell it. Other stores do it much more. I don't, because we have a lot of stores here like this and I don't want to raise my prices high and stuff gets expired and wasted. The most money I get from the stuff we make ourselves: salads, breads pastries pirozhkis. This is not as good as we make." The baker comes in at midnight and if you drove by in the wee hours you'd see the lights on and two or three people working. Vykhovanets, who is six months pregnant and has three children, arrives at 3 a.m. on Friday to make salads for the rush. These include spicy carrot salad, from Kazakhstan, ("carrot, spices, hot sauce and hot oil"), a pink herring layered salad (herring and cooked and shredded vegetables with beets and mayonnaise) and a salmon salad of salted raw salmon. Fruit and veg come from the Pacific Coast Fruit Company in the central east side. Most of her recipes are from her mother, who also lives in Vancouver, Washington. 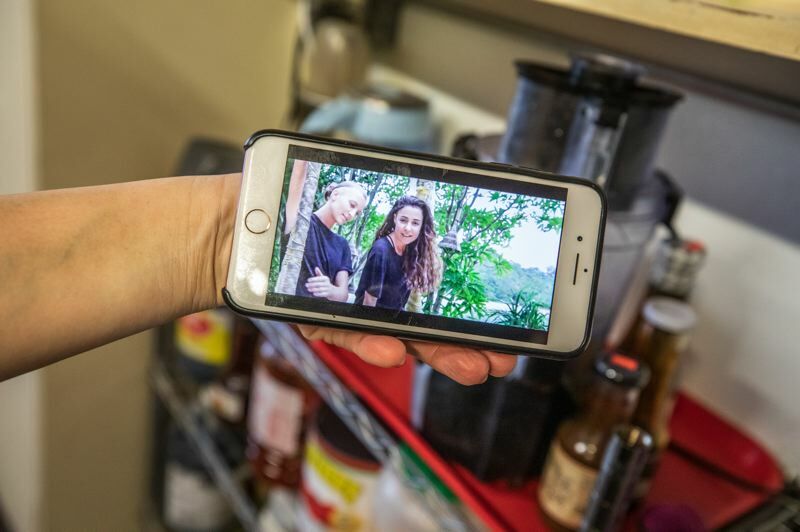 She uses Facebook, Instagram and Snapchat for marketing, and is taking a break from advertising on Russian radio Slavic Family 11:30 a.m., to see if it makes any difference. She's not changing the moniker from @russiantelegantfood any time soon. "It's a lot of hassle to change everything. We're two people with two businesses and a family." Social media works for her. She wipes off and grabs her phone when she has a moment. And the response is often "Fresh pirozhkis, looks so good, I'm coming in today." She says they know it's the same food, but just seeing it on screen makes them want to come in and buy. Vykhovanets's sister Tatiana Shibitov works in the bakery too. At night they crank the music from YouTube on her phone. Bands like The Two Mashas. "Russian, Ukrainian, English, Arabic, all pop music," Shibitov says. They blast it through a big Bluetooth speaker on wheels as they chop out dough on large tables and slice vegetables for salads. Shibitov has six children, two granddaughters and 32 nieces and nephews. In joking about the price of following all their birthdays, she says "That's why I'm in here working 24-7." It's no joke: Vykhovanets missed the Slavic Celebration at IRCO, despite sending food, because of work, just as she misses church because of work. Her husband takes with the children while she's in making giant salads. Vykhovanets avoids pork. The Seventh Day Adventists who live near Russian Elegant Food, many of whom prefer to walk, are from Russia, the Ukraine and Moldovia, and eschew pork and alcohol. The Russian speaking community is united around church and work, less so around geography. 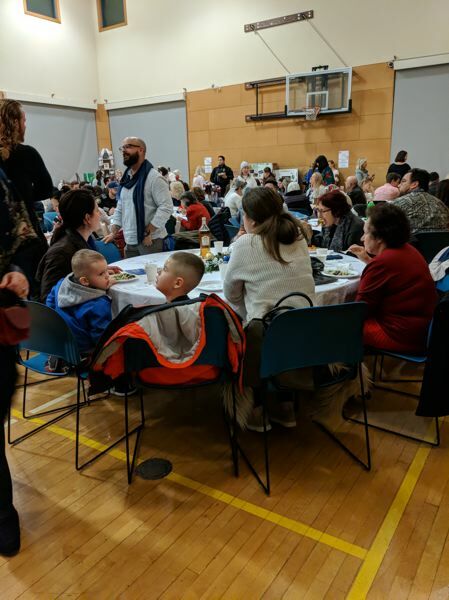 At the celebration at IRCO, Oleksander Moskal, a branch manager at the Ukrainian Federal Credit Union, told the Business Tribune "We're working on our dream of having a Ukrainian center. Maybe our next branch will be the center? 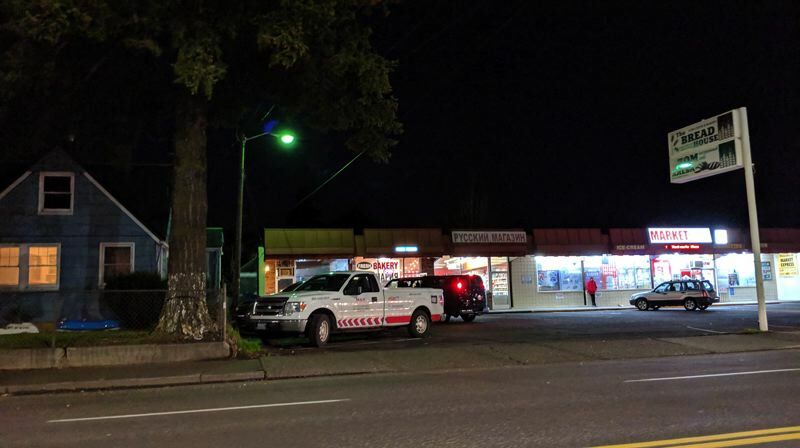 He says that just as on Powell he'll see a Ukrainian store next to a Ukrainian dental office and a Ukrainian insurance office next to Ukrainian trucking company, maybe his credit union could be the anchor of a community plaza. He touts the credit union, which is headquartered in Rochester New York, as an economic refuge. "Immigrants weren't able to get loans from their own financial institutions. We make loans to purchase trucks and real estate, we offer credit cards, we're a full-service institution." Moskal says many Ukrainians work in the construction industry although after the great recession many went into long distance trucking. He also sees them becoming taxi drivers and working retail. "I am pleased to see many immigrants going to college and becoming professional, lawyers and doctors. I am a proud father, my daughter graduated from UCLA with a major in biology and a minor in Spanish, and is looking at a graduate degree." 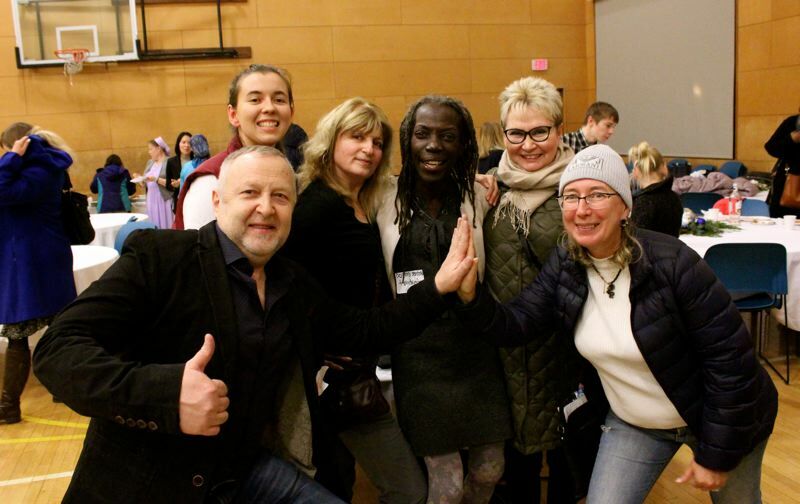 He adds, "We're proud of our members of our community, such as Professor Oleh Taratula and his wife Olena Taratula, researchers at Oregon State University." Asked whether the Ukrainians mix much with the Russians (they share a language) Moskal said "To a certain point, yes, at Slavic churches like Ukrainian Bible Church and the Ukrainian Church of the Evangelical Baptists." Moskal says there are 25,000 Ukrainians out of 40,000 post-Soviet immigrants in the Portland area, but that is growing, and thinks the 2020 census will show more like 50,000 out of 80,000. He is VP of the Ukrainian American Cultural Association and talks of working with Mercy Corp International bring medical supplies to the Ukraine after the Russian annexation. The war is not abstract. "You know the situation, this is the fifth year when Russia was the war on Ukraine. Even my nephew died six months ago. Army truck blow up on a Russian mine. He was patrolling border, Russian separatists put the mine on the road and he unfortunately died six months ago." 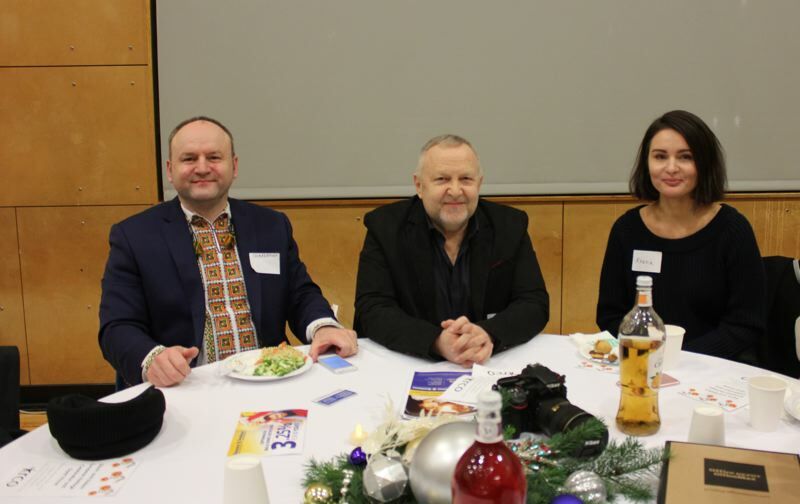 Also at the party was Yuri Boyechko the publisher of two glossy Russian language magazines, one a local community magazine, one nationwide for truck drivers. He's also the chairperson for the Slavic Advisory Council for the Chief of Police. "We do a lot to unite Russian and Ukrainian and American people," he says. Do they mix? Boyechko says in 1989-1994 they were united in fleeing post-Soviet Russia for religious reasons. Today its more fleeing for political reasons, and to escape war. "Of course, what happened between Russia and Ukraine have some tension, but I hope we are already past this. It was 2013-2016. Right now people kind of sort it out and live normal lives here, I hope." 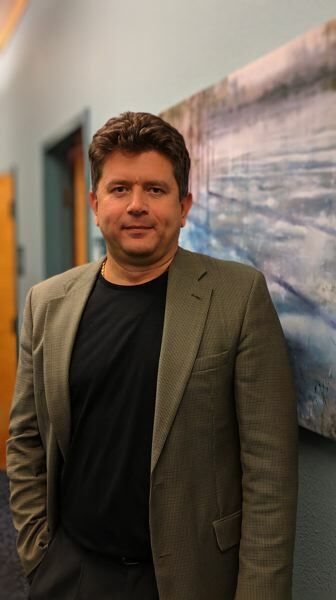 He estimates a third of Portland area Russian speakers are involved in the trucking industry, with Portland being with one or two in the most important Russian language trucking hubs out of Chicago, Sacramento, Seattle and Portland. The Russians are still coming! Portland State's Population Research Center says the Portland area is home to more than 50,000 immigrants from the former Soviet Union — most of whom come from Ukraine. 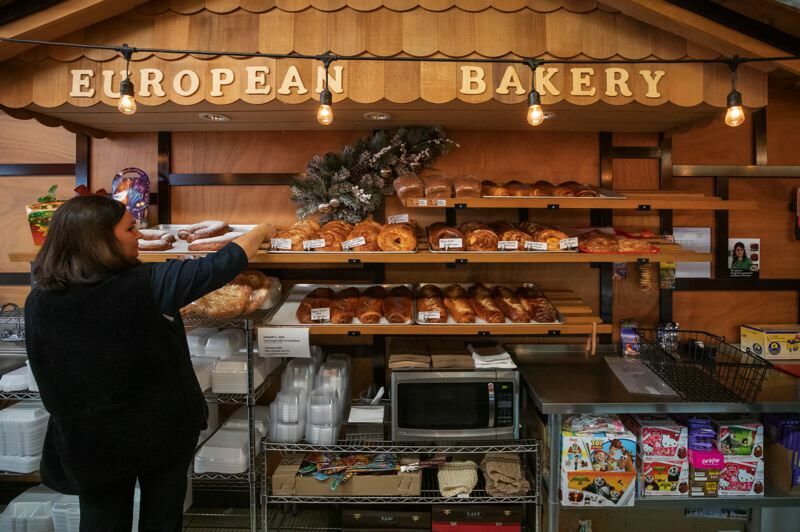 With 14,000 Slavic immigrants in Vancouver, 25,000 in Multnomah County and 2,000 in Washington County, many have prospered and moved away to the suburbs. Two of their big churches are the Pentecostalist Slavic Church Emmanuel on Southeast 82nd Avenue and the Sulamita church in Fairview. Alex Mikhno of Allstate Insurance grew up in Kiev in the Ukraine. 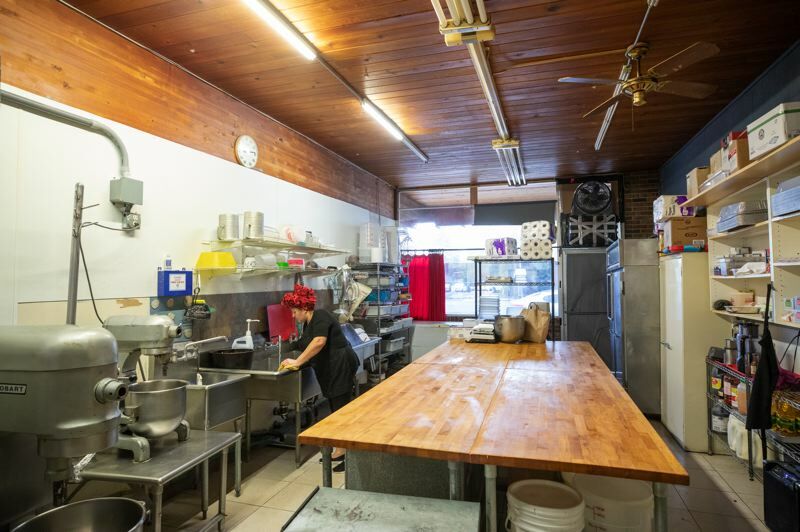 His business is in Fourth Plain road, the main drag in Vancouver. He sees new immigrants all the time. "A lot of people don't speak English. First day in the U.S. they need insurance: health, car insurance, life, boats, all kind of stuff." He estimates 35 percent of his customers are new to the country. "Some are professional. I have doctors, teachers, businessmen, and people not doing anything yet. Number one is construction, then truck drivers. 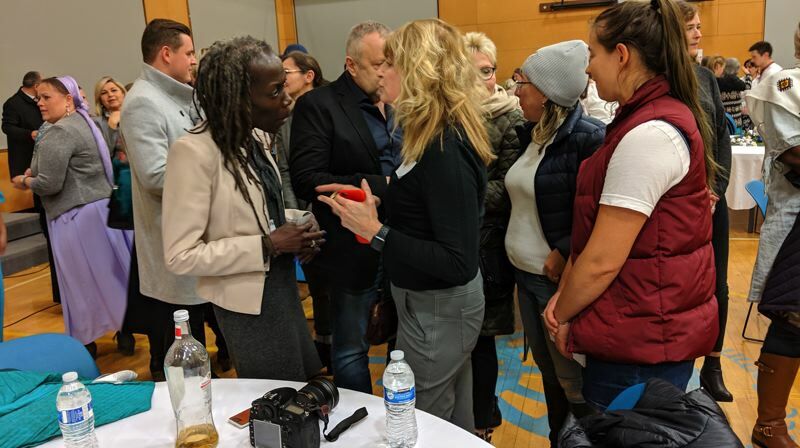 I have a few friends in the medical field, some in spa, hair salons…" He says the community is not big enough to have the kinds of amenities, like bath houses, that you'd find in Chicago or Seattle. "It's a different culture here. Seattle is a bigger community. There's not enough here to do things like that."